Developed through a broad-based public process, the Minnesota Food Charter offers a shared roadmap for how all Minnesotans can have reliable access to healthy, affordable, safe food in the places they work, learn, live, and play. We believe this access will reduce the risk and cost of obesity and diet-related diseases, like diabetes and heart disease; conserve state resources; and boost economic prosperity. HOW DID WE DEVELOP THE FOOD CHARTER? Thousands of Minnesotans in many communities and organizations helped develop the Food Charter. They attended events, contributed their ideas online, and provided leadership, identifying challenges and solutions related to healthy food access. To this input, we added expert opinions and the most current research on effective strategies for overcoming Minnesota’s barriers to healthy food access. 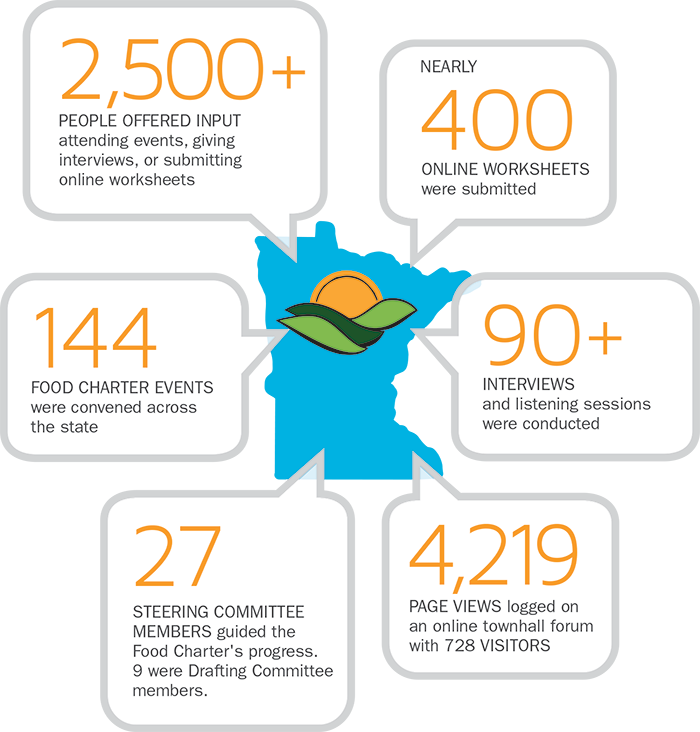 The Food Charter is intended to guide planning, decision-making, and collaboration for agencies, organizations, policy-makers, and public and private entities across the state.